This week’s episode features a conversation with Antii, a member of Moscow Anarchist Black Cross about the call-out for solidarity with Russian anarchists and anti-fascists. This starts off with a description of the cases of: Dmitry Buchenkov (accused of participating in anti-Putin protests in Bolotnaya square on May 6th, 2012); Alexei Gaskarov (accused of anti-police violence and riotting in anti-Putin protests in Bolotnaya square in 2012); Alexei Sutuga (a Siberian street-level antifascist accused of brawling with neo-nazis); Ilya Romanov (anarchist former prisoner accused of attempted terrorism to stop the development of Kulibinsky park in Nizhny Novgorod); Alexander Kolchenko (Crimean antifascist accused of attempting to resist the Russian takeover of the region formerly of Ukraine); & Elizaveta Tsvetkova (accused of hate-crimes against police for posting up anti-police leaflets). 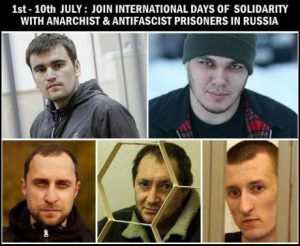 Each of these prisoners are inside because of their activism and are considered political prisoners locked in the Putinist prison system. During the hour Antii, who was exiled from Russia, talks about the cases of these 6, a more general context of anarchist and antifa action in Russia these days and about the prison system Russia. Kara Wild is an artist, comrade and resilient force of nature, currently being detained in France for her alleged participation in a protest against draconian labor reforms and police repression. She is a trans woman and is currently being held in a mens jail without access to hormones. She is also a U.S. citizen and has been denied bond because French authorities consider her a flight risk. On May 18th, thousands of people converged in Paris to defy an ongoing siege of police violence and to oppose a new neoliberal labor reform. During one of these marches a police car was attacked and set on fire. Kara was brutally arrested in connection to this incident more than a full week later, at a separate event. She is currently being accused of attempted voluntary manslaughter of a person holding public office, destruction of property, group violence and participating in a masked armed group. Kara is among 6 people currently facing charges in connection to this incident. To make matters worse, Frances Prime Minister, Manuel Valls is vowing to execute unrelenting punishment, in order to set an example and de-mobilize protests.